It was a fun packed weekend for music lovers in Lagos as Hennessy Artistry took clubbing experience to a whole new level for the 2013 club tour. The Hennessy Artistry club tours held at Rhapsody’s Lounge in Victoria Island and Road Runners Nightclub in Yaba at the same time! They were both filled to capacity with euphoria and anticipation as music lovers partied to an amazing blend of urbane music from popular disc jockey, DJ Xclusive. Irawo queen and Hennessy Artistry supporting act, Seyi Shay who made her debut Artistry appearance at Rhapsody’sLounge got guests in high spirits as she performed her hit tracks, Irawo, Loving you, Killing me softly as well as a new track off her forthcoming album. SDC also gave a pulsating performance blending their hit singles, Farabale, Feel Alright making guestssing along and scream with excitement. Voice of the streets, and self acclaimed Baddoo, Olamide took the place of Hennessy Artistry headliner who was unable to attend the event due to his delayed flight from London. Olamide brought the roof down with his mind-blowing performance. He later moved down to Road Runners Nightclub to surprise Man of the Year, Phyno as well as guests in attendance. 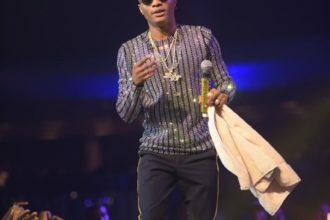 Phyno who had already started thrilling fans with hit song, Man of the Year got a shocker when he started performingGhost Modeas Olamide stormed the stage to perform the track with him driving guests wild. Olamide later performed Durosoke before leaving the stage. Sean Tizzle and Kay Switch also delivered energetic performances thrilling fans with some of their hit songs. Notable faces at the Rhapsody’s Lounge in VI include Iyanya, Toolz, Toke Makinwa, TolaOdunsi, AY, DJ Neptune, Koch, Fadeamong others. The next stop for the Hennessy Artistry club tour is Crescendo’s Nightclub in GRA Ikeja. The event will feature performances from Phyno, Chidinma, Vector and Sean Tizzle. See fun photos from the event.